A Book by Miriam Manela to Help Your Child Thrive! Does your child have any of these common behavioral challenges? Over-sensitivity, irritability, anxiety or nervousness? Withdrawn; finds touch, sound, or other sensations uncomfortable? Overly rough and rowdy behavior? Frequent angry outbursts or temper tantrums? Difficulty with peers and problems with teachers? Does your child’s behavior get in the way of his relationships at home, school, or play? Do you wish you could help your child, and improve your relationship with him? Now there is a way to help your child overcome these behaviors and improve your parent-child relationship. Miriam Manela’s groundbreaking first book, The Parent-Child Dance: A Guide to Help You Understand and Shape Your Child’s Behavior, teaches parents her creative, easy, and effective techniques to help shape behavior—the same techniques that she’s been teaching hundreds of satisfied parents and children for over a decade. Featuring beautiful illustrations by popular illustrator Dena Ackerman this is a truly innovative approach to the parent-child relationship. Miriam Manela has the key to help you unlock the mystery of your child’s challenging behavior. A compassionate, insightful, user-friendly book. This book is like having an occupational therapist living in your attic! An additional benefit of [the activities in this book] is the strengthening of the parent-child relationship. What’s Inside The Parent-Child Dance? 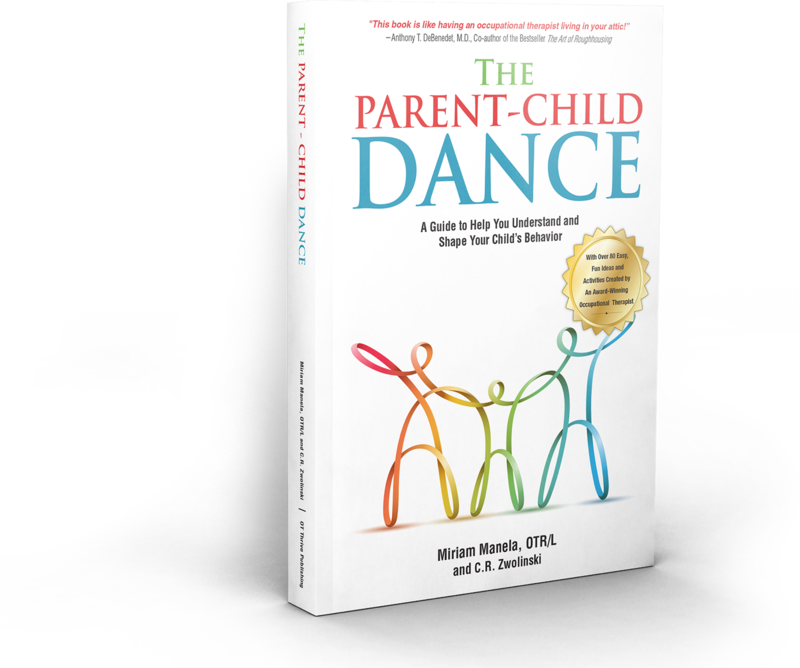 The Parent-Child Dance contains over eighty activities and tips to help children with a range of sensory processing difficulties, many of which lead to behavioral issues that affect life at home, school and play. These activities are proven to work, and Miriam has used them to help hundreds of children and their parents at Thrive, her occupational therapy practice. With its sensitive illustrations, and clear, step-by-step guidelines, this book shows you how to help your child become calmer, happier, and more focused. Isn’t that what every parent wants? The book also gives you something every parent wishes they had—the tools you need to help you build a meaningful parent-child bond. Miriam Manela explains the “why” behind these behavioral types, and gives parents proven tools that nurture measurable change and growth. Even better: All the tools, activities and ideas in The Parent-Child Dance have been used successfully by parents and children in Miriam’s private practice and they can all be done easily at home without special training or expensive equipment. Also, children love the activities because many of them feel like play! You and your child will learn Climbing and Crashing, Hat Trick, The Pizza Massage, Blow the House Down and many, many more engaging activities, each with unique variations so you can customize the activities to suit your child’s needs and preferences. In The Parent-Child Dance, some of Miriam’s pediatric clients also share their personal stories and give the reader a unique glimpse into how a dysregulated child feels inside. Plus, there’s a chapter just for parents, with tips and insights that put you on the path to calmer, more effective parenting. The Parent-Child Dance is available in paperback and Kindle edition at Amazon.com.